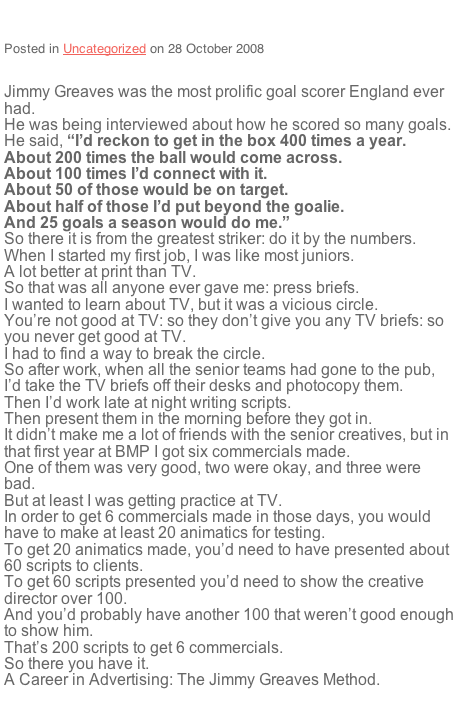 Dave Trott is a very, very wonderful creative with a very wonderful blog. This item particularly impressed me and is the sort of mantra this generation of youngsters could do well by if they used it as a guide to life. I’m presenting a ‘master class” to the advertising course at Napier University and thought I’d use it as a way of discussing my all time favourite advertising, but I’m stumped for one of the ads I want to show. I can’t find it anywhere. Can anyone help? Anyone have access to this that could email me a JPEG? Here it is! Thanks to the wonderful Chris Miller who spotted that it was not a Nike ad at all, but Adidas. It’s still a bloody peach though.